After applying for the job of our dreams, we have all had that feeling of anxiety when waiting to hear back. When you get invited for an interview, it obviously suggests the employer is interested in employing you and thinks you are likely to be a good fit for the company. Now it falls on you to convince them they are right. The biggest piece of advice you will read everywhere: preparation is key. Find out exactly the role you will be undertaking in the business and what it's likely to entail. This could involve reading industry blogs and trade magazines, or following someone in a similar position to you on LinkedIn. The closer you are to knowing what your job will entail, the better prepared you can be, allowing you to tailor your examples of communication and attention to detail to the role. Confidence is simply a state of mind. Getting closer to feeling completely confident in yourself will show in your interview. Even if you are nervous, a good interviewer will recognize this and try to put you at ease with a few minutes of conversation before the questions begin. The biggest way to feel confident is to look sharp and feel confident in what you are wearing. Although this doesn't always mean a suit/blouse and skirt, this does mean looking professional. The colors that you wear may have more of an effect than you expect. Although they are unlikely to make or break your job prospects, it could give you that edge over your competition. Coordinate you color scheme in order to look the part. If you are wearing a suit or blazer, make sure the colors are block, and match them with your trousers or skirt. Evidence suggests that the color of the tie you wear to an interview could have an effect on your interviewer. Red is a strong color that suggests a slightly fiery personality, as it suggests love and passion. On the other hand, it attracts the eye and makes a person look for other red things, which more often than not is your lips. This can encourage someone to take note of what you are saying. I’d recommend a red tie for sales or client facing roles to show the interviewer you are confident and able to handle yourself appropriately. Blue alternatively is a soothing color that reminds people of the sea and sky. This shows the person interviewing you that you may be calm and sincere. 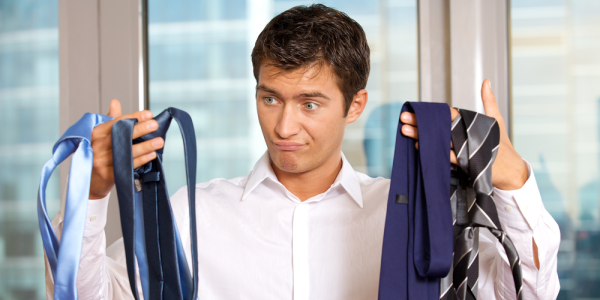 Studies suggest that wearing blue is the color that is most likely to get you the job. However, it can also make you seem a bit conservative and indecisive, possibly not able to make a decision. At the end of the day, the decision will be based on a lot more variables than simply the color of your tie. However, by gaining confidence from these factors, overall you are more likely to get the job. Make sure that you try on everything you are planning to wear the day before, to ensure everything fits and you feel at ease. Smart Suit or Smart Casual? With the rapid emergence of the dotcom and creative industries, this has led work fashion away from the typical suit, shirt and tie. Most of us have all been in the position where we turn up for an interview in a suit, and the interviewer is basically wearing a beach towel! Try not to let that happen. This all boils down to understanding your job role and what it is you will be required to do. If you are likely to be client facing in any industry, a suit is usually your safest bet. Sales are almost a definite interview to wear a suit, too. However, in the more behind the scenes roles, a jumper and tie is likely to be a good bet. It shows that you can use your judgement, which is technically what your potential employee will be paying you for, so do a good job. Remember the color schemes too!